NEMI strives to manufacture the most quality, user friendly products for CNC machines. 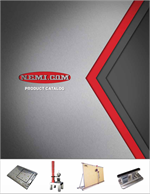 NEMI has been manufacturing digitizers, tool setters, vacuum pods, vacuum cups, vacuum tables, vacuum chucks and software for many years. Our commitment to quality products has helped our users improve efficiency while out-performing their old systems continually. We take pride in the products we make here in Minnesota and will continue to add new products based on our customer needs for increased production. You will find many products on our web site to fit all needs of any machine. NEMI has many years of experience manufacturing aerospace, wood and plastic parts. We specialize in vacuum workholding products. As you browse through our web site please call if you have questions on our products. We also have online brochures available for your convenience. Thanks for taking the time to check us out! These vacuum chuck systems can be bolted directly to a T-slot table or clamped in a machine vise. Add Pod & Rail capabilities to your flat bed machine! The NEMI Square Vacuum Suction Cups and Pods are the ideal OEM replacements for Breton, Park, Intermac, Northwood, Brembana, Bavelloni and most any other machine.